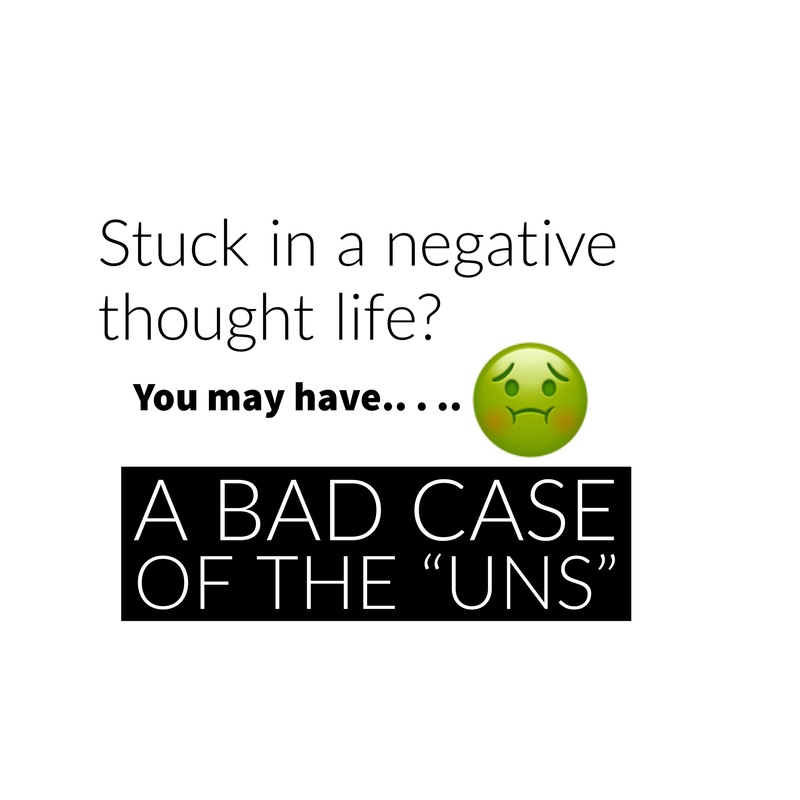 Ever get a bad case of the “Uns”? It’s kind of like tummy problems, but for the mind. If you ever get a case of the “uns”, it expels all the healthy contents of your mind and heart. Every day we have situations and circumstances that can cause anger, sadness or fear but have you ever been stuck in a rut of negative thought patterns? If so, you probably contracted a case of the “Uns”. Hope is the result of believing and expecting God’s promises to be fulfilled. When we stop believing what God has said about His plans and our lives, despair is soon to follow. If I am ungrateful for what I have, I will never have enough. This applies to about anything: money, friends, attention, ‘likes’, opportunities, possessions and the rest. True gratitude for what I have paves the way for what I want. 1 Timothy 6:6 But godliness with contentment is great gain. 10 For the love of money is a root of all kinds of evil. Some people, eager for money, have wandered from the faith and pierced themselves with many griefs. Philippians 4:6 Do not be anxious about anything, but in every situation, by prayer and petition, with thanksgiving, present your requests to God. 7 And the peace of God,which transcends all understanding, will guard your hearts and your minds in Christ Jesus. Unforgiveness is refusing to give what God gave me. If I do not forgive, I cannot be forgiven and I will not have abiding peace with God as long as I hold onto un-forgiveness. When I will not forgive I am refusing to trust God with the outcome. Matthew 6:15 But if you do not forgive others their sins, your Father will not forgive your sins. Is there something that I have not surrendered? Is there something that God has instructed me that I am intentionally not doing? Surrender and obedience provide immediate satisfaction, joy and peace in our soul. The funny thing about surrender is we tend to be so afraid to give up our right to be our own leader when the truth is Father knows exactly what we need because he created us. Matthew 16:24-25 Then Jesus said to His disciples, “If anyone wishes to come after Me, he must deny himself, and take up his cross and follow Me. “For whoever wishes to save his life will lose it; but whoever loses his life for My sake will find it. 2 Corinthians 10:5 says to take every thought captive to the obedience of Christ. When we allow seeds (thoughts) planted by the enemy in our minds to take root and grow, they produce all kinds of poisonous fruit. It takes discipline to take thoughts captive. If we allow every thought and emotion we experience to take the wheel, eventually we will find ourselves on the brink of insanity. It takes discipline to set and maintain our course in line with what God says about us and our situation. All of those issues are remedied by following the leadership of the Holy Spirit. So, the next time you find yourself stuck in a rut of negative thoughts or emotions, check to see if one of the “uns” are plaguing you. And, if this has been helpful, share it on your wall or other places. Friends don’t let friends suffer from the “uns”. Pingback: Picture Pages! 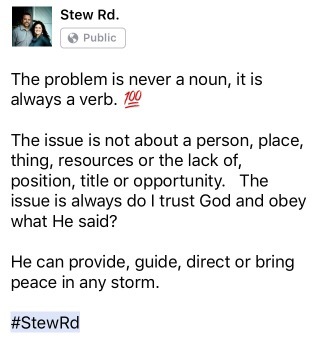 – Stew Rd. Pingback: 5 Dream Killers – Stew Rd.